Sean Parker, who changed the music industry as a teenager and then went onto have an early and formative role in Facebook, has long had one frontier that he’s wanted to change: American democracy. Now he, Matt Mahan, and a team of engineers and product talent who have long worked at the intersection of technology and policy, are unveiling Brigade for the first time. 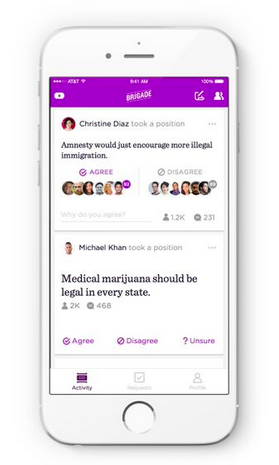 It’s an app they’ve worked on for the last year that’s meant to quickly get regular people engaged in articulating and debating political positions. If that sounds like a steep order for the Millennial generation, Brigade’s team has tried to tamp down expectations. They’ve tried to make the product as simple as possible as it enters private beta this week, so that it’s easy for lots of people to pick up. Parker repeatedly stressed that Brigade’s current form was just a beta, and the company had been actively courting feedback from testers. That’s a big 180° from the flashy, celebrity-laden unveiling of his last stealth startup Airtime. That app promised a social entertainment revolution through video chat, but flopped due to a buggy launch demo and a product few found critical to their lives. Now Parker’s back with grander ambitions to fix democracy, but a modest approach to getting there. “The mission of the company is to empower people in their civic life and to have influence over the direction their society goes in by having them articulate and identify where they stand on issues uncover alignment with friends, get organized into groups of like-minded people and ultimately act collectively to shape the policies that affect their lives,” said Mahan, who was previously the president and CEO of Causes. Brigade CEO Matt Mahan Interview from Brigade on Vimeo. At its core are simple stacks of cards that you can agree or disagree with. For example, a trending topic today is “Trade With Asia.” You can flip through a series of cards with statements like “Massive international trade agreements hurt small businesses in America” or “International trade deals expand opportunities for American goods abroad.” If you take a position, you’ll see a polling chart that shows the percentage of Brigade users who are either for or against your side. If you’re not sure, you can flip through reasons that argue for both sides. 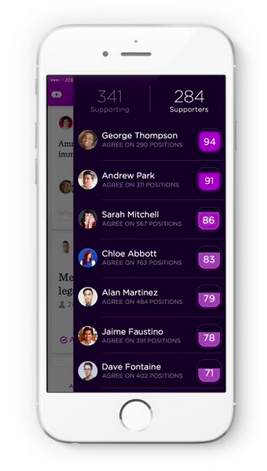 Out of the 13,000 users in the private beta a test version of the app that was secretly released several months ago, the average Brigade user took 90 positions, which the company feels is a really high level of engagement. Over time as you take more positions, you’ll create a profile that you can compare against friends, colleagues and family members. So I can see the people in my network that I’m most politically aligned with. Although Brigade has done some early events with politicians like presidential candidate Rand Paul, the company says its political make-up ranges across the spectrum. “A lot of people are progressive as you’d expect for a company in the Bay Area. But we’ve got quite a few folks who would self-identify on the other end of the spectrum,” said Mahan. The big obstacles for Brigade are proving that publicly stating your political opinions is both something you actually want to do, and that you want to do on its app. Exposing stances on controversial issues can cause points of contentions with friends, family, and colleagues. Many are happy to quietly vote for their beliefs, but might not want to trumpet them in perpetuity online. If users are willing, they’re likely already able to do this elsewhere. Politics enthusiasts frequently take to Twitter, which has the scale to give them a large audience, and easy ways to get the message amplified through retweets. Broad opinion sharing networks like State have failed to capture a significant user base. And while getting on your Brigade soapbox might be fun occasionally, becoming something users find engaging enough to consistently return to may be difficult. People tend to forget about apps they don’t use at least once a week. He added that Silicon Valley’s political identity is really hard to encapsulate. Lots of politicians from both parties often ask him how to engage with the technology industry.